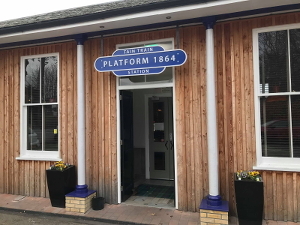 Graham Rooney, chef and owner of Platform 1864 on Tain Railway Station, was presented with a plaque in June in recognition of the transformation he has made to the original station building. Presenting the plaque, given by Tain & Easter Ross Civic Trust, Lachie Stewart, chairman of the trust, said, "Until Graham opened as a restaurant, train travellers to Tain were met with an initial depressing view of boarded up buildings upon their arrival." The restaurant opened in 2015, having received backing from Transport Scotland's Community Regeneration Fund and the Railway Heritage Trust. The name of the restaurant was suggested by Emily Vass, a pupil at Craighill Primary School. Emily's great, great, great grandparents had, coincidentally, been the first people to buy a ticket when Tain Station opened on 1st June 1864.